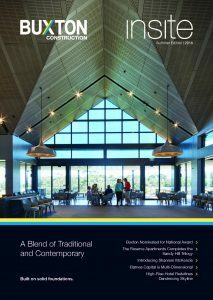 We are excited to announce that the Buxton Construction Corporate Brochure is now online! Our corporate brochure offers insight into Buxton’s core values, capabilities and rich history. It is available here or under the ‘About’ tab at the top of the Buxton Construction home page. Check it out! We are excited to announce Buxton have been announced as the preferred contractor for the construction of a new project – Stage 1 of Nelson Bourke with Orion International Group Development. The project comprises 111 residential apartments over two towers, with both buildings sharing a common ground level over a 2 level basement carpark. This project is due to commence October 2017. Development approval from the shire has been issued at Hidden Valley Golf & Country Club with construction due to commence early August 2017. The Hidden Valley Golf & Country Club redevelopment is an Arcadia Group project; a trusted and respected client of Buxton Construction. Buxton and Arcadia have collaborated together previously, on the Rylands of Kew and Rylands of Hawthorn retirement villages, and have built a strong, prosperous relationship. Works are progressing well at the Bayside Masonic site in Gardenvale, with the Nepean Highway facade approaching successful completion. Parts of the exterior scaffolding are scheduled to be dismantled throughout August 2017. The East elevation is complete and base building works on Ground to Level 2 are ahead of schedule. The main fit-out on Level 3 and the carpark on Level 1 is on track for completion before the end of the year. Works are progressing well at the CV apartments in East Hawthorn. Basement excavation, rock anchors and shot-crete walls are now complete to the bottom of B3 level, across the site. The $112 million project comprises 140 apartments over two towers, as well as an infinity pool, communal dining lounge, gymnasium, and retail tenancies. Demolition is complete at Hidden Valley Golf and Country Club in Wallan. Onsite works is expected to commence in six weeks. The project comprises redevelopment of the existing golf clubhouse with associated member’s facilities, including a resort day spa, indoor pool and gym, function and conference centre, kitchen, bar and an outdoor dining area. 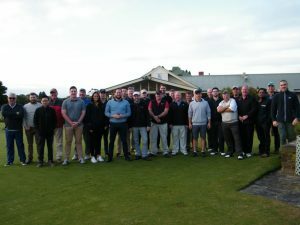 Buxton Construction recently spent an enjoyable day on the green at Peninsula Kingswood Golf Club in Dingley Village. The competition was played in teams, over eighteen holes. The winners from the day were Stephen Baker, Glenn Stein and Rawdon Hume. In second place was Rob Marsh, James Thomas, Andrew Wright and Babu Akula and third place was awarded to John Adams, Sebastian Sosa and Andrew Tseros. Special mentions go to Tim Edmonds for having the longest drive and Ben Cavell and John Adams for winning nearest to the pin. We are thrilled to be working with Blueprint Projects on the preliminary planning of a development in Swan Street, Richmond. The mixed-use development includes the demolition of an existing building and comprises a two-level basement, ground floor retail and 28 New York-style apartments over five levels. Relocation of high voltage power lines will also be required to enable the project to proceed.